The cleanly arranged dashboard brings a touch of elegance to your driving experience. A seamlessly integrated central display keeps the most important information in direct sight. *Odyssey 18YM VTi-L shown. ^Odyssey overseas model shown. #Odyssey 17YM VTi-L shown. Experience a seamless wave of power with a Continuously Variable Transmission (CVT). Designed to ensure the throttle responds curtly when you press the accelerator, the result is exhilarating acceleration and a smoother, more natural driving feel. For more performance-orientated driving, simply switch into S-mode and take manual control of seven fixed gear ratios with steering wheel mounted paddle shifters at your fingertips. VTi-L shown. Overseas model shown. VTi-L model shown. Available VTi-L model only. Smart Parking Assist System is a driver assist technology and should not be used in place of safe driving practices. Drivers should continue to monitor the road ahead and take care when maneuvering the vehicle at all times. +Requires compatible iOS7 device (iPhone 4S or newer). °Requires compatible Bluetooth device. Compatibility and functionality will vary depending on the device. ÜSUNA is a registered trademark of Intelematics Pty Ltd. Coverage includes Melbourne, Sydney, Brisbane, Gold Coast, Adelaide, Perth and Canberra metropolitan areas. Refer to sunatraffic.com.au for full details. The Bluetooth word mark is owned by Bluetooth SIG, Inc. and use of such mark by Honda is under licence. *Odyssey VTi-L only. *Tri-zone climate control available on VTi-L model only. Leather-appointed seat trim means some parts of the seats may contain synthetic material. VTi-L shown in Platnum White. VTi-L model shown. Multi-view camera is a driver assist technology and should not be used in place of safe driving practices. *VTi-L model only. Cross Traffic Monitor is a drive assist tehcnology and should not be used in place of safe driving practices. Drivers should continue to monitor the road ahead and take care when manoeuvring the vehicle at all times. VTi-L shown in Platinum White. In the event of a collision, the seatback springs are optimised so that the seat will more equally absorb the occupant's impact in a manner that can minimise the severity of a whiplash injury. Hill Start Assist prevents roll back when starting on an incline. The system controls brake pressure, keeping the car stationary for a moment after you release the brake pedal. The Odyssey gives you child seat anchorages for the 2nd and 3rd row seats, because when you’ve got kids on board, it’s good to be flexible. VTi-L models add ISOFIX child restraint anchor points to the second row. CR-V shown for illustrative purposes. The Odyssey VTi-L's headlights feature side lamps on either side that illuminate the direction in which you are turning, thereby reducing blindspots and helping bring potential hazards to light sooner. Overseas model shown for demonstrative purposes. *The Drive Away price shown is for an Odyssey in your chosen colour. It includes metallic/pearlescent paint (where applicable), 12 months registration, 12 months compulsory third party insurance (CTP), a recommended dealer delivery charge, stamp duty and administration charges. The drive away price shown is based on the vehicle being garaged in the postcode you entered, and owned by a ‘rating one’ driver aged 40 with a good driving record and may differ depending on your circumstances and (for applicable states), your choice of insurer. We strongly recommend that you confirm the final drive away price with your Honda dealer. 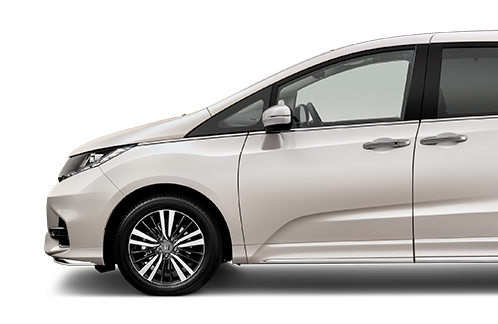 † 7-Year Unlimited Kilometre Warranty available on new and ex-demo Odyssey models purchased between 1.5.18 – 30.6.18 and delivered before 30.6.18, except those used for commercial purposes, where a 7-year/200,000 kilometre (whichever occurs first) warranty is applicable. Honda warranties apply where due care is exercised by the owner and the vehicle is maintained in accordance with the Owner’s Warranty and Service Manual. Please visit honda.com.au/warranty for full terms and conditions. ~Leather-appointed means some parts of the seats may contain non-leather material. 3rd row seats contain no leather material. Please select a Honda Odyssey you would like to test drive.